Asteroids Change Colour - Universe Galaxies And Stars Section. 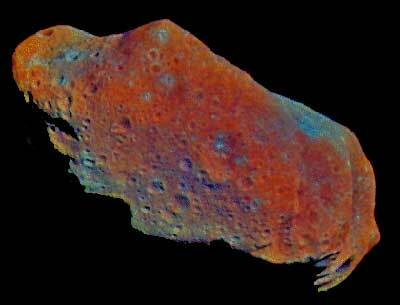 Asteroids Change Colour With Age. A team of Astronomers led by the University of Hawaii's Institute for astronomy have found evidence that asteroids change colour as they get older. The team used data from the Sloan Digital Sky Survey (SDSS), which has accurate colour measurements on 100,000 asteroids. They found that asteroids turn redder over time because of the constant bombardment of radiation from the Sun and cosmic rays. With more research, Astronomers should soon be able to judge the age of an asteroid just by its colour. In an article published today in the journal Nature, a team led by Robert Jedicke of the University of Hawaii’s Institute for astronomy provides convincing evidence that asteroids change color as they age. David Nesvorny, a team member from the Southwest Research Institute in Boulder, CO, used a variety of methods to estimate asteroid ages that range from 6 million up to 3 billion years. Accurate color measurements for over 100,000 asteroids were obtained by the Sloan Digital Sky Survey (SDSS), and catalogued by team members Zeljko Ivezic from the University of Washington and Mario Juric from Princeton University. Robert Whiteley, a team member from the USAF Space and Missile Systems Center in Los Angeles, points out that "the age-color correlation we found explains a long-standing discrepancy between the colors of the most numerous meteorites known as ordinary chondrites (OC) and their presumed asteroid progenitors." meteorites are chips of asteroids and comets that have fallen to Earth’s surface. According to Jedicke, "If you were given a piece of rock from the Grand Canyon, you might expect that it would be red, like the colorful pictures in travel magazines. You’d be forgiven for questioning its origin if the rock had a bluish color. But if you were then told that the rocks turn from blue to Grand Canyon red because of the effects of weather, then everything might make sense. Your gift is simply a fresh piece of exposed rock, whereas the pictures you’ve seen show weathered cliff faces millions of years old." Nesvorny explains that this is similar to the situation experienced by asteroid astronomers. "The meteorites are gifts of the solar system to scientists on Earth-pieces of asteroids delivered to their own backyard. The mystery is that the OC meteorites have a bluish color relative to the reddish color of the asteroids from which they were supposedly released." Jedicke asks, "How could they possibly be related?" About thirty years ago, a "space weathering" effect was proposed to explain the color change. Meteorites, whose surface is affected by their fall through Earth’s atmosphere, are usually studied in laboratories by observing their freshly cut and exposed interiors. Billions of years of exposure of the same material on the surface of an asteroid to solar and cosmic radiation and the heating effect of impacts of tiny asteroids might alter the surface color of asteroids in exactly the manner required to match the color of asteroids. Jedicke said that they found that "asteroids get more red with time in exactly the right manner and at the right rate to explain the mystery of the color difference between them and OC meteorites." He added, "Even though we have found a link between the two types of objects, we still don’t know what causes space weathering." Once these researchers refine their analysis by obtaining more colors of the youngest-known asteroid surfaces, it will be possible to determine the age of any asteroid from its surface color. They are currently searching for a space weathering effect on other types of asteroids in the solar system. Funding for the creation and distribution of the SDSS Archive has been provided by the Alfred P. Sloan Foundation, the Participating Institutions, the National Aeronautics and Space Administration, the National Science Foundation, the U.S. Department of Energy, the Japanese Monbukagakusho, and the Max Planck Society. The SDSS Web site is http://www.sdss.org/.